Grapefruits sometimes seem like the forgotten citrus fruit. While lemon, lime, and orange juices and zests slip their way into any number of sweet and savory recipes, the grapefruit tends to sit apart, almost invisible to shoppers despite its girth, waiting for a little attention until it can spring its sprightly juice and turgid segments onto the wise few. My pet theory is that while oranges and lemons have flourished for generations in such culinary cradles as France and Italy, the grapefruit, native of wonderful yet distant Barbados, has been the citrus errant (Hm... Founding Father Alexander Hamilton was born in Barbados. He never got to be president). In any case, this leaves the field wide open for some serious grapefruit innovation. When I saw this recipe in Gale Gand's Butter Sugar Flour Eggs, I was thrilled. Cake. Grapefruit. Must eat. It turned out okay. 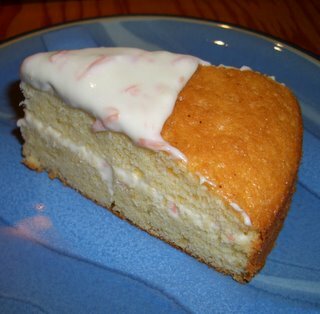 The cake part is verges on the dryness of a sponge cake, but still has enough spring and moisture to qualify as something more. Despite the juice and the zests, it had only a faint citrus flavor. It just seems like a decent yellow cake. It is low fat, though -- only a 1/4 c oil and 3 eggs for an 8 serving cake. As for the high fat frosting, I halved it. I didn't want to buy two packages of cream cheese (which would end up in may stomach). My creative icing solution may look weird, but it leaves open the possibility of a second topping. Stay tuned after the break. The frosting is probably my fault. I whipped it up all fluffy in the mixer, but somehow misread "2 tsp of grapefruit segments" to be mixed in as 2 tbs and didn't even halve it. The frosting went from frosting to something more like grapefruit cream cheese spread. Very glossy. A bit oozy. The difference in water and maybe acid between the two measurements must have been the cause. It's still provides the bulk of the grapefruit flavor for the cake, but doesn't do much to add to the average cake itself. Since there is that spare tire around the icing on top, I may try brushing simple syrup, or perhaps a kind of honey syrup on top. A coating of syrup would probably taste good under the frosting, too. I feel like a grapefruit cake could work very well, but either someone else can have better luck with the recipe or it needs a little tweaking. I was a bit irked that it calls for using the mixer 3 times when 2 would be sufficient--yolks can be hand mixed--but that's spoken by a single mixer bowl owner. Anyway, for a nice grapefruit fix, you could always just put this frosting on a yellow cake or cupcakes for similar results. Or maybe add another flavor in or on it for a flavor bounce. Or eat a chilled grapefruit plain.... more flavor, less fat and sugar. Heat the oven to 350. Butter, flour, and parchment a 9 inch cake pan. Whisk the egg yolks in a mixer fitted with a whisk attachment (or using a hand mixer). With the mixer running, drizzle in the oil. Drizzle in the grapefruit juice. Add the grapefruit and lemon zests and mix. Sift the sifted flour, sugar, baking powder, and salt together. Add to the egg yolk mixture and mix. Whip the egg whites in a clean dry bowl until stiff but not dry. Fold into the cake batter. Pour the batter into the pan. Bake until dry and springy in the center, 25-30 minutes. Let cool in the pan 15 minutes. Run a spatula around the edge of the cake, turn out onto a wire rack, peel the paper off the top, and set aside to finish cooling. Using a paring knife, cut a slice off the top and bottom of each grapefruit to expose the flesh. Cutting from top to bottom and following the contours of the fruit, remove the peel and white pith completely. Cut the grapefuit sections free of the membrane and set aside to drain on paper towels, turning occasionally. Beat the cream cheese in a mixer fitted with a paddle attachment (or using a hand mixer) until smooth and fluffy. Add the lemon juice and zest and mix. Gradually add the sugar and mix until smooth. Chop 1 or 2 grapefruit sections to measure 2 teaspoons, add to teh frosting and mix. With a long serrated knife, cut the cake in half horizontally. Lift off the top layer and transfer the bottom layer to a serving plate. 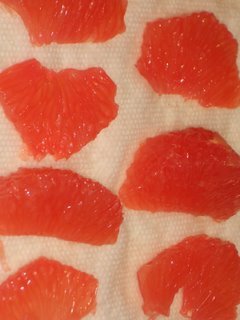 Frost the cut side and arrange half the remaining grapefruit sections on top. 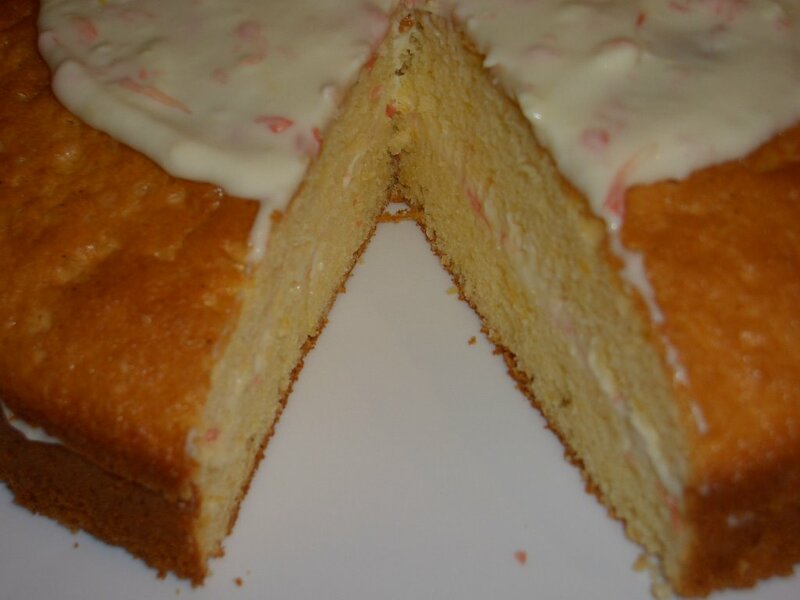 Replace the top layer of the cake. Frost the top and sides and arrange the remaining grapefruit sections on top.